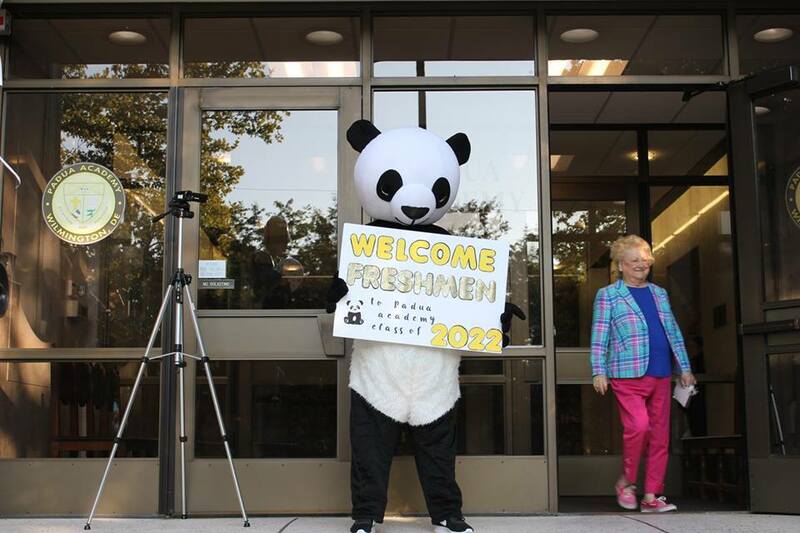 Mrs. Mann, right, welcomes the class of 2022 at the beginning of the school year. She announced that she would not be returning next year on Jan. 16, 2019. Deciding to retire was the hardest decision Mrs. Mann has ever made. Padua, as she put it, has been her life for the past eleven years. “I just need to get a little more rest than I can get with this job,” she said. The decision, she explained, was made with the guidance of God. “I continuously asked God the same thing: ‘Show me what you want me to do. I want to follow in your path,’” she said. She described “a peace that comes over you that you know everything’s gonna be alright,” and her hopes of doing something meaningful next, although she is not yet sure what. “I leave the doors open for God to show me what the next page is going to be,” she said. Mrs. Mann hopes to leave behind a sense of leadership instilled in each student. In her absence, she hopes to see Padua “become the very best school possible for young women on the east coast.” She also hopes to be able to spend more time with her grandson in retirement. Mrs. Mann announced her retirement on Jan. 16, surprising some students more than others. Most students knew it was going to be soon, but not all expected it to come this year. “I expected that Mrs. Mann would be retiring before the graduation of the class of 2021, but I didn’t expect it to be so soon,” said sophomore Kat Jennings. Other students knew Mrs. Mann’s time was coming. “When she got to the [microphone] and said she had something to tell us, I kind of expected her to retire because she had been principal for so long and I knew she wasn’t feeling the best,” said sophomore Alyssa Barnak. Senior Sarah Jane Mee wasn’t surprised by the announcement, but she did not feel prepared. Mee hopes that the next principal is ready for the challenge of running Padua. Barnak agreed. “I believe someone younger can connect with the students more and help improve our school,” she said. Some students feel that Padua will be very different without Mrs. Mann, while others feel that her impact won’t be easily diminished. “Although our principal is retiring, the lessons Mrs. Mann has left with her students will never diminish. The rules may change, but our sisterhood won’t,” said Mee. Sophomore Molly Shapiro hopes the next principal respects the progress Mrs. Mann made, but won’t try to imitate her. “I think it’ll be weird not having Mrs. Mann and not hearing her voice over the announcements will be sad, but I think she transformed this school in a very permanent way, and I don’t think much will change,” she said. Dr. McClory, the current vice principal, was grateful to have worked with Mrs. Mann during her time at Padua. Dr. McClory feels that Mrs. Mann has impacted Padua “tremendously” in numerous ways by bringing her many years of educational experience to the school. “I think she’s really encouraged all of us to… take a look at the programs and the courses that we’re offering to make sure that they’re really the best that our students need and want,” she said. According to Dr. McClory, one of the improvements made under Mrs. Mann’s leadership was the schedule realignment. “By moving forward with doing a schedule analysis and coming up with a different schedule, it really expanded our opportunities to develop a variety of electives,” she said. Dr. McClory expressed that she will miss Mrs. Mann’s energy and enthusiasm. Mrs. Fundakowski, the academic dean, agreed that the new principal should focus on developing the core values of Padua. She recognizes that leaving was in Mrs. Mann’s “best interest,” and feels that she is leaving the school in a position enabling it to positively continue her legacy. 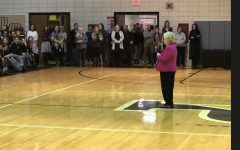 Mrs. Mann got Padua’s name out into the community, she said, making connections in Wilmington that allowed for further development. Mrs. Fundakowski hopes that the atmosphere Mrs. Mann has spent years developing will continue with the next leader. The Board of Trustees will help to find the next principal, but the final decision will be made by Father Mark J. Wrightson and the superintendent, Dr. Louis De Angelo. Mrs. Mann’s announcement did not come as a complete surprise to Father Mark. Wrightson explained that the board is currently in the early stages of finding a new principal. A search committee has been put together to review applicants, and an announcement has been sent out throughout the diocese and to other principals and administrators as well as in local Catholic publications. Names will be forwarded to him and the superintendent. “From there, I sit with the diocese, and we work out and try to make a choice that we think will be best for Padua Academy,” he said. Father Mark will base his choice for the next principal on his or her ability to lead, especially in terms of the day-to-day running of the school. It is likely, he explained, that in the following year the position of president will be established. This person would be responsible for managing external issues pertaining to the school. By making this decision, Father Mark hopes that more time will be devoted to these “external” matters. While students and faculty may have some input in the decision, Mrs. Mann will play a role in selecting the next principal. Board member Jennifer Kenton feels that Mrs. Mann gave a direction and strategy to the school that will leave a lasting impact.